You've never tasted vegan cheese like this before! Vegans and non-vegans alike are celebrating husband and wife team Veronica Schwartz and Pablo Castro of Dr-Cow in Williamsburg, Brooklyn. Dr-Cow makes their exceptional vegan cheeses in small batches with strictly organic ingredients. Three flavorful cheeses (2.5 oz each) -- reishi mushroom, cajun and smoked -- are delicately handcrafted from raw cashews and aged for seven weeks. Paired with olives, Potter's organic Winter Wheat vegan crackers, a cheese knife and fresh fruit. 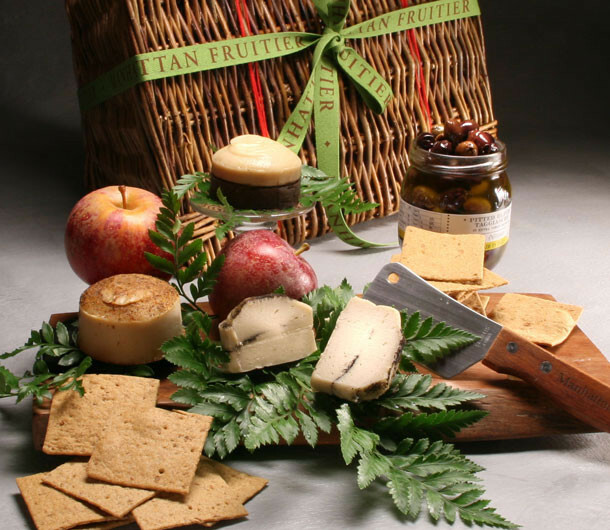 This Strictly Vegan Cheese Hamper is not strictly for vegans!